This document has been drawn so as to help protect your business, provide an administrative framework for your arrangements with agents. Use it for a deal with a single agent or a corporate organisation; for selling to gift shops or the Department of Defence. 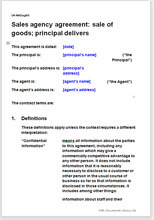 This document is suitable for any person setting up one or more commission agents to sell goods inside or outside the Republic of South Africa.